We used neutral colors in this design; white for the walls, black stone for the floors and Iroko wood to add some details. 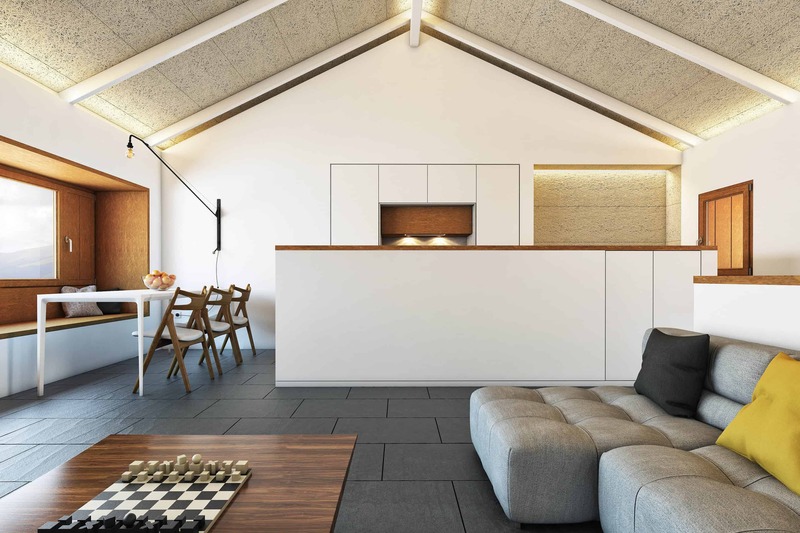 The ceiling is Heraklith and the kitchen stone is Inalco, both not so difficult materials to create in 3D. I built the 3D model in 3DS MAX, using V-Ray as the render engine. For lightning, I just made use of Vraysun for natural light and Vrayplane and VrayIES for indoor light. All post production was done in Photoshop, Nik color effects and I used basic render elements. The furniture models that I used were CarlHansen for chairs, Prouvé light by Vitra, B&B Italia for the sofa and Duravit for the bathroom. I have received good comments on my Behance profile an others social networks with this project. I’m aware that I still have to improve in a lot of aspects but these compliments give me the energy to outdo myself. I hope you like it. My name is Cristian Andrade. I’m an freelance interior designer and 3D artist.